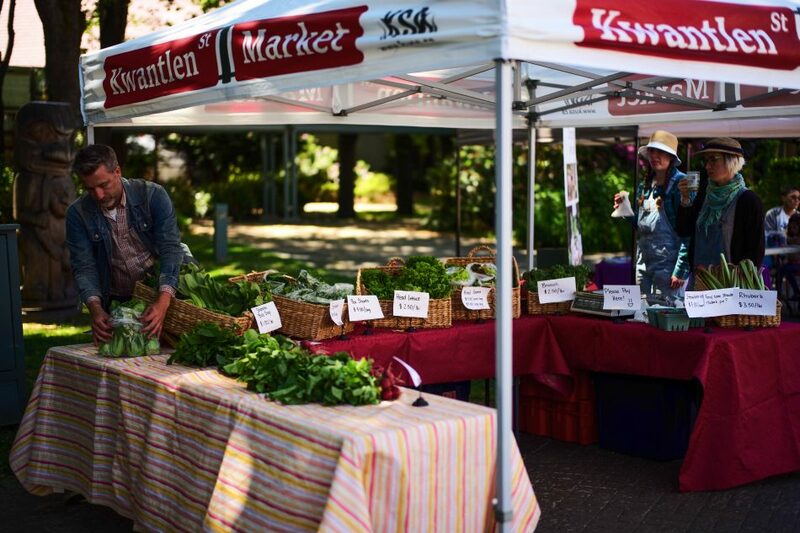 The Kwantlen St. Market is back once again for the summer, this time in a new location with free parking. It will be held every Tuesday until October from 12:00 to 4:00 pm in Minoru Plaza, just outside of the Richmond Public Library. In the past, KPU’s own farmers market took place in the large parking lot of the Richmond campus. While convenient for students, it didn’t draw in as many members of the general public as organizers had hoped. The new location is close to the busiest mall in Richmond and is within steps of the public library, art gallery, swimming pool, ice rink, and running track. Despite this, the market has always been a big hit, especially amongst KPU students and faculty members. “Sometimes we do sell some of this stuff on-campus, and students do love it, especially the design wing,” says Dodds. All of the produce sold at their stand was grown in Richmond, whether it was greens from their terraces on campus or other foods from their farm on Gilbert and Dyke. Soon, they will be across the street from the Garden City Lands, on Garden City Road. Produce sales go back into the Sustainable Agriculture program to be used for seeds and research equipment. “Anything we can do to get fellow Kwantlen students to eat fresh, organic produce, the better. Because it’s good for them and it’s good for us too,” laughs Dodds. However, it’s not only students and student groups managing booths at the events. A vendor selling upcycled jewelry, made by taking discarded materials and making them look new again, was also present at the market. 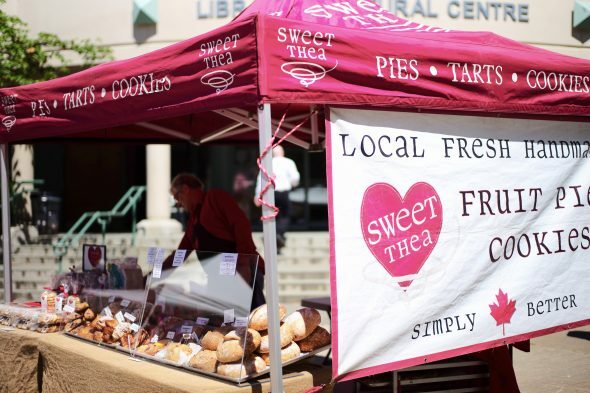 Laurie Mercer of Langley-based bakery Sweet Thea is happy to see a farmers market in central Richmond. Mercer explains that the application process to be a vendor is rigorous. Consistent with rules at other farmers markets in B.C., the application page states that “all vendors must be personally and actively involved in the production of all products available for sale at the market.” These sorts of rules are designed to uphold the community nature of the market.